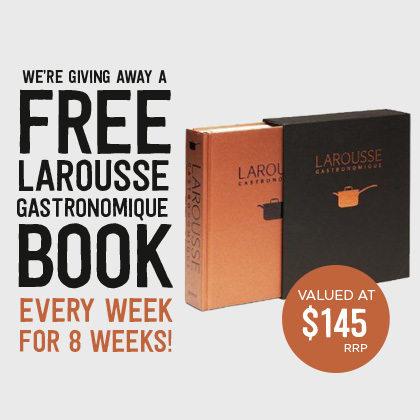 Tip Top Foodservice is giving foodservice professionals around Australia the chance to win a copy of New Larousse Gastronomique every week for eight weeks! We know all chefs have books they go back to time and time again for reference, inspiration or just comfort. This modern classic will become your right-hand-man throughout your foodservice career. To enter tell us in 25 words or less: what is your most read kitchen companion book? Each week, the most creative answer will win a copy of New Larousse Gastronomique.